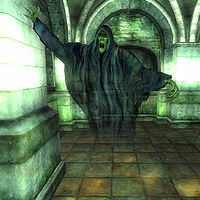 Wraiths and all of their variants are often encountered throughout the darker parts of Cyrodiil. Wraiths are categorized into the weak Faded Wraiths, common Wraiths, and the far more powerful Gloom Wraiths. The higher level the wraith, the higher their health and the stronger their spells. All wraiths have a unique and debilitating curse that they frequently employ, and they are immune to silence. Most wraiths have several additional spells, in particular ones that deal frost damage and silence targets. As further protection, roughly half of all wraiths carry a leveled sword. 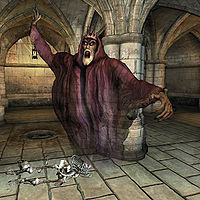 Wraiths are relatively large hovering ghosts that wear tattered black robes (except Gloom Wraiths, which wear purple). Faded Wraiths and Wraiths are nearly identical in appearance; the only difference is that Faded Wraiths are more transparent. The two weaker types both have sickly green skin and deep black eyes, while Gloom Wraiths have a lighter brown skin tone and glowing white eyes nestled in large eye sockets. Gloom Wraiths are most easily recognizable by the crown perched on their ghostly heads, evidently a symbol of their previous status while still living. When nearing any wraith, you may notice a high pitched keening like the wail of a banshee. Upon death, yellow-green vapor comes out of their mouths and they collapse into a pile of robes. Faded Wraiths are considered the weakest variant of wraith and are commonly encountered at lower levels. However, don't underestimate them, as they can be a challenging opponent to anyone not prepared with silver, Daedric, Dremora, or enchanted weapons. Found in Cheydinhal Chapel Undercroft during The Elven Maiden quest. At level 16+ Llathasa's Spirit appears as a Wraith. Wraiths are encountered at the middle levels. They are much stronger than Faded Wraiths and should be approached with caution. It is strongly recommended that you enter combat without having an almost full inventory, as they make good use of burden spells that deprive you of all ability to evade their other attacks. Gloom Wraiths are the strongest variant of wraith, and appear only at the higher levels. They differ greatly in appearance to other wraiths, and are formidable foes in battle. They are commonly encountered in large numbers in chapel undercrofts, so take care in entering. Attack you during your sleep after being exiled from the Dark Brotherhood. The 215-health wraith is sent the first time you are kicked out; the 500-health wraith is sent the second time; the 700-health wraith is sent the third time. 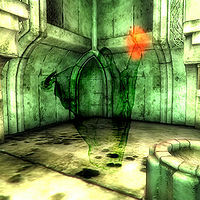 Upon death, the death animation may not play; leaving the Wraith standing as if it were still alive, but fully lootable. Using the Paralyze spell on a Wraith and killing it while it is stunned sends its remains through the ground texture thus rendering it unlootable in most cases. When using a life detection spell, weapon-wielding Wraiths will emit two life forms, the second of which is the weapon. Esta página foi modificada pela última vez à(s) 06h39min de 26 de julho de 2015.